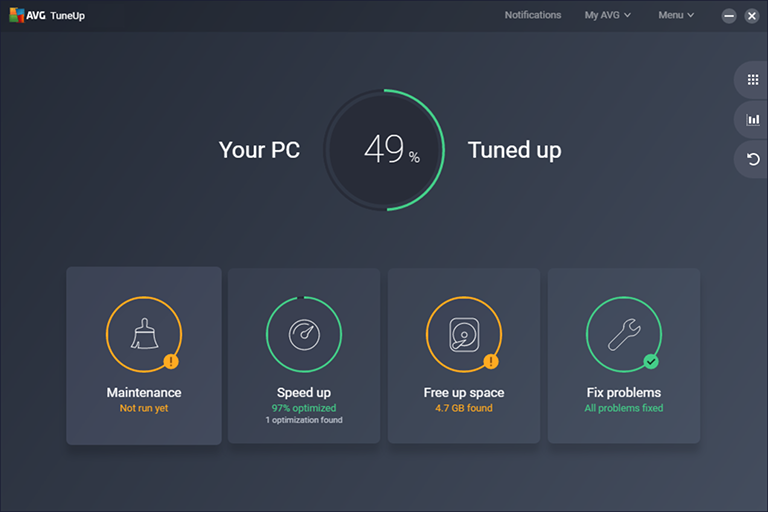 new-and-improved TuneUp Utilities: now called AVG TuneUp. Have TuneUp Utilities, or trying to get it? Then you’re in the right place: because on top of updating the name, we’ve completely re-engineered the TuneUp you know and love, and packed in all-new features. Speed up Speeds up your PC using Sleep Mode. Automatic MaintenanceImproved Cleans and speeds up PCs, as well as deleting treacherous tracking cookies once per week. Disk & Browser CleanupImproved Cleans up 200+ apps and now supports the latest browsers and programs. Continuous updates We’ll give you all the essential updates and security patches. Software UninstallerNew Gets rid of bloatware and adware bogging down your PC. Unlimited InstallsNew Install AVG TuneUp on every PC in your household. Automatic Software UpdaterNew Updates the most critical programs on your PC to plug security holes and fix bugs. Everything you loved about TuneUp Utilities - just a whole lot better, with more than 4 years of improvements and more advanced tuning technology. Our patented Program Deactivator technology detects performance-draining apps and temporarily puts them “to sleep”. Helps you delete unwanted software like bloatware, trials, or adware - and programs you haven’t used in a while. Removes junk from over 200 applications and Windows features, and clears out Tracers from popular browsers. *Our lab tests were performed on various machines, ranging from recent ultrabooks to desktop PCs, using industry-standard tools. **Performance was evaluated using PCMark Vantage. The results are measured in “points”. The higher the number, the faster the computer. Trusted by experts. Loved by users. I just bought a new laptop a few days ago and as you can guess it was preloaded with a lot of crap [...] The first thing I did was install my favorite killer combo: AVG Internet Security and AVG PC TuneUp. I could almost immediately notice a difference in speed and stability! After doing all the necessary tweaks it runs at top speed. PC TuneUp is great! It does everything - makes the computer so fast and the best cleaner out there. Well done, AVG. Since I installed PC TuneUp, my games run more quickly. I'd like to tell you what a top-notch product this is and that it just works. Your business is absolutely reliable. Thank you! AVG PC Tune Up is the only way to go. Keeping my computer up and running smoothly is what it's all about.